New York City is one of the most popular destinations for international travelers coming to the United States. It is divided into five boroughs that are each divided into their own districts. Each borough has its own vibe and distinct character. Many visitors choose to stay near the famous Times Square area, which is located in Manhattan. Manhattan is the most famous island in New York and is located between the Hudson and East Rivers. It is where you'll find the Empire State Building, Central Park, Wall Street, Harlem, and more. Times Square, or the Theater District, is located on the western side of Midtown. The neighborhood is surprisingly diverse and is a major entertainment zone in New York. It's centrally located so it is a good option for visitors who want to be near all of the action. How much do hostels in New York City cost? Located right near Times Square, this hostel is just minutes from Port Authority, Penn Station, the Garment and Theater Districts, Rockefeller Center, Radio City Music Hall, and more. It's a budget friendly option for travelers who want to stay near all of the action in New York City. It's also near public transportation so you can travel almost anywhere in the city with ease. The staff is friendly and helpful as well, so do not hesitate to ask any questions you may have. The rooms are relatively quiet and there is a breakfast available to guests as well. Although the rooms are somewhat small, this is typical for hotels and hostels in New York City. The hostel is kept clean and it is comfortable and social. This is a popular option for budget conscious travelers who are visiting New York City and don't want to break the bank, but want to be in a great location. This is a hostel for the budget conscious. It's well located just two blocks from Times Square and is near plenty of restaurants, clubs, bars, and of course theaters. It's also very close to public transportation so it's easy to access almost any neighborhood in the city. There are private rooms that have a double bed that sleeps two people as well as a private bathroom. Some of the rooms are under renovation and should be updated soon. Other services to guests include wireless internet access in the lobby and a computer station for those who do not have their own computer. 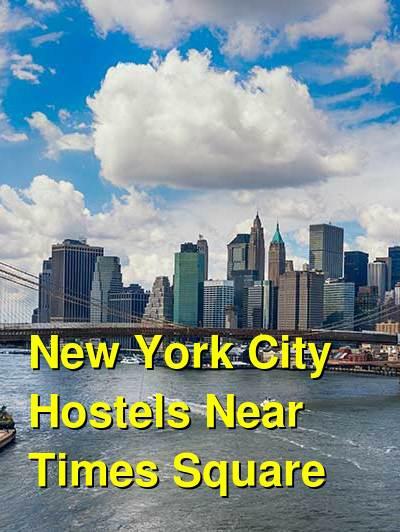 The hostel is only three blocks from Rockefeller Center, four blocks from Radio City Music Hall, five blocks from Lincoln Center, and six blocks from Central Park. The Empire State Building is 12 blocks away as is Madison Square Garden. One of the largest hostels in NYC, Chelsea International is conveniently located near Times Square. The rooms are comfortable and relaxed and it is a good option for a variety of traveler types. There are several room options to choose from including private rooms and dorms of varying sizes. With a kitchen and a courtyard (rare for the city), it is quite social and makes for a great opportunity to meet up with other travelers to explore the Big Apple. Amenities available at this hostel include free breakfast, free pizza on Wednesday nights, free WiFi/internet, lockers, and towels. A bit of a walk to Times Square, but still close to many other sights as it's in the heart of Manhattan and the city.